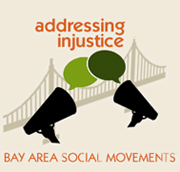 In 2013, activists in the LGBTQ community quickly organized around the proposal of Bradley (Chelsea) Manning—which was then rescinded—as a candidate for Grand Marshall in that year's SF Pride Parade. The controversy regarding Manning highlighted problems in the evolution of the largest LGBT gathering in the nation and indeed in the gay rights movement itself. From parade officials' support of the military to legalization of gay marriage to the Manning contingent as the largest non-corporate contingent in the parade, politics within the movement is explored. 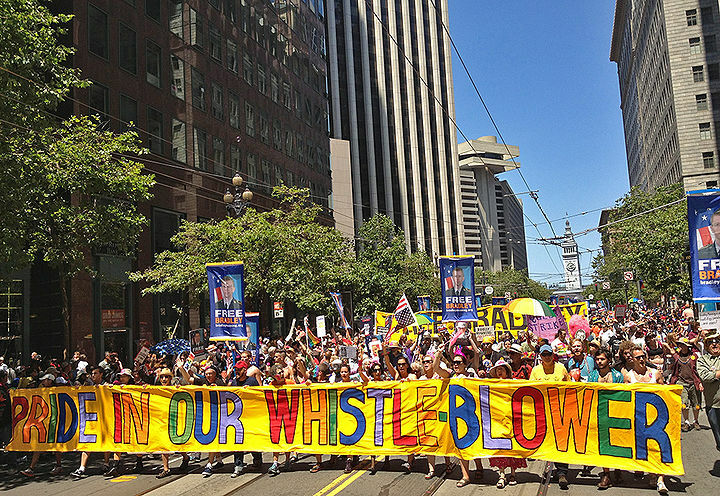 Manning contingent was the largest in SF Pride march, June 2013. No sooner had this honor been bestowed upon Manning when San Francisco Pride Board President Lisa Williams released a statement revoking the honor. The statement indicated Manning's nomination had been an error committed by someone within Pride going rogue and “never should have been allowed to happen.” Williams wrote: "Bradley Manning(2) is facing the military justice system of this country. We all await the decision of that system. However, until that time, even the hint of support for actions which placed in harms [sic] way the lives of our men and women in uniform— and countless others, military and civilian alike — will not be tolerated by the leadership of San Francisco Pride. It is, and would be, an insult to every one [sic], gay and straight, who has ever served in the military of this country." The response to Williams' statement from the more radical edge of the gay rights movement in the Bay Area was swift and furious. Williams' statement seemed to many on the “queer Left” as horribly illustrative of an ongoing tension within the movement for gay rights: are we looking to join the system, imperialism, war, and all, or are we opposed to the rotten status quo and want to radically transform it? Had Manning not “made significant contributions to the LGBT community” in revealing U.S. war crimes in Iraq? Do queers not care about militarization, racism, imperialism, and massacre in the name of patriotism and “freedom”? In response to Pride's rejection of Manning as a grand marshal, supporters of Manning decided to nominate her as “Community Grand Marshal” and marched in the parade in her honor. 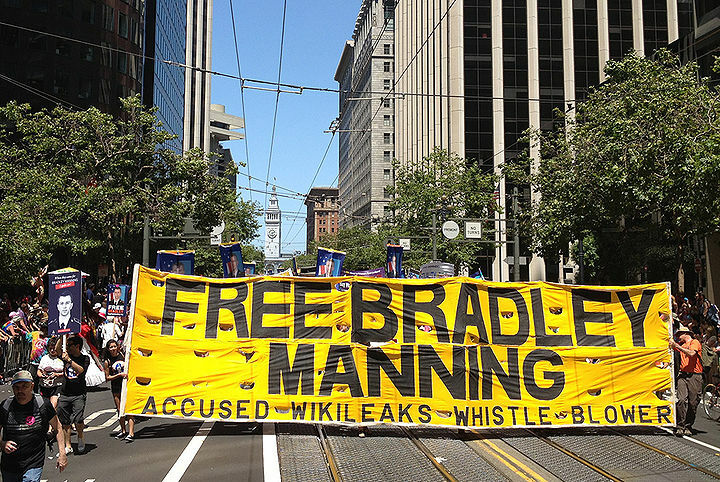 Organizers of the contingent expected to draw a few hundred people, but the “Bradley Manning Support Network” contingent drew over 2,000 people marching in support of the jailed, queer military whistleblower whom SF Pride had pointedly turned its back on. The energy in the contingent, which spanned four city blocks, was high, with many people carrying signs that read “When they came for Bradley Manning, I spoke out,” “I'm Proud of Bradley Manning,” “Shame on SF Pride,” and “Bradley Manning Walks With Me.” Others carried signs reflecting the intersectional demands of the left leaning part of the gay rights movement: “Stop violence on LGBT people” and “Smash racism, sexism, and bigotry,” In the part of the contingent where I marched, we chanted loudly throughout the march, “L, G, B, T, Bradley Manning Speaks for Me, L, G, B, T, Q, Bradley Manning Speaks for You” and “They Say Court Martial, We Say Grand Marshal!” Other than several people belligerently booing us, the response from the crowd was overwhelmingly positive. There were some seemingly befuddled people as well: “Why are these gay people carrying signs saying “Shame on SF Pride” while they march in the SF Pride parade?” their faces seemed to say. Luckily, marchers had lots of informational materials to hand out, and did so. In other parts of the contingent, people played and danced to music, did flash mobs, and the Brass Liberation Orchestra played rousing brass tunes for queer liberation. One longtime queer activist who has lived in San Francisco for 30 years told me that nothing except marching in support of Manning could have convinced her to march in the Pride parade, which she said had long since become a sellout. Brass Liberation Orchestra rocks the Manning continent at SF Pride, June 2013. The controversy over Manning's inclusion as a grand marshal in the 2013 San Francisco Pride Parade felt like a stark and important referendum on the direction of the gay rights movement. San Francisco Pride took place the weekend of June 27 through 29, 2013. Just the day before, on June 26, the U.S. Supreme Court had struck down California Proposition 8 and the federal Defense of Marriage Act. Gay marriage was now legal in California in addition to 15 other states, and the federal government no longer defined marriage as a union between a man and a woman. President Obama's administration had not even defended the Defense of Marriage Act in court for the last two years; the national tide on gay marriage seemed to have officially turned. People in the gay rights movement had a variety of responses to these Supreme Court victories, from unequivocal jubilation to hesitant celebration to absolute disavowal of marriage as an institution. But in San Francisco, with Pride weekend coming on the heels of a victory for the most heavily resourced gay rights battle of the past decade, the overwhelming response seemed to be “Pride is going to be SO AWESOME!” People wanted to celebrate this victory with rainbows, glitter, dancing, and jubilance. The large Bradley Manning contingent in the 2013 Pride parade was the largest non corporate contingent and second in size overall only to Google. (4) It seemed to me to be emblematic of the radical backlash against the mainstream gay rights movement and its assimilationist agenda. While searching for and waiting in a very long line to use a porta potty a long ways from the Manning contingent, I watched other individuals, floats, and contingents. The mood was, while not completely apolitical, certainly very celebratory and not very fierce, angry, or radical. Everywhere I turned there was a corporate float or a well branded (read: rainbow on corporate logo) corporate employee: Wells Fargo, Google, Clear Channel, Kaiser Permanente, Bank of America, BMW, Facebook, Macy's, Salesforce, JP Morgan Chase, Twitter. I was reminded of a protest photo I'd seen awhile ago that read: “Stonewall was a riot, not a brand.” Where was the anger about the economic crisis caused by the very banks marching in the parade whose nefarious practices have left many queers homeless? Where was the outrage about the displacement of low income queers due to astronomic rent prices driven by the tech industry? Is this what success looks like? Is this what liberation looks like, to have corporate giants flocking to the “largest LGBT gathering in the nation?”(5) Is this the best that the largest LGBT gathering in the nation can do, to open its arms to corporate giants wreaking havoc on queer communities, and reject a queer whistle-blower who alerted us to war crimes committed in our name? “NO” was the resounding answer from 2,000 people at Pride that day, and I hope that number continues to grow. 2. At the time, Manning was still going by Bradley. She has since made public that she now goes by Chelsea.